On Sunday morning, it was so warm I didn’t even need a coat when I went outside. By midnight, the roads were icy and buckets of snow were on their way. In these final days of freezing winter, I truly just want to make the most of earthy, spicy foods before I have to give them up for spring salads. So I made saag paneer. Have you ever had that? It’s basically a phenomenally spiced spinach and cheese dish, which you can eat with a fork or by swirling a piece of garlicky naan bread through it. Classic wintery goodness. I avoided Indian foods for a long time. For some reason, I thought the flavor profile didn’t appeal to me. I also looked somewhat askance on the rows and rows of single-veggie type dishes I found at Indian buffets. 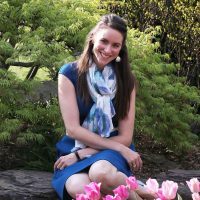 As a vegetarian, I have trained myself to try to eat several different veggies together for the best balance of nutrients…so a dish made of only chickpeas or only spinach was hard to embrace. Then, a few months ago, a switch clicked for me. Suddenly I realized that Indian spices are probably my favorite out of all the flavors on continental Asia. (Yes, I do realize that statement is totally uninformed, as Indian food varies dramatically from region to region. But I’m doing the best I can here.) Basically, I ate a bowl of saag paneer at my local Asian market, and I fell in love. While this dish isn’t terribly challenging to make, it is time consuming. The longer you cook it, the more the flavors develop. 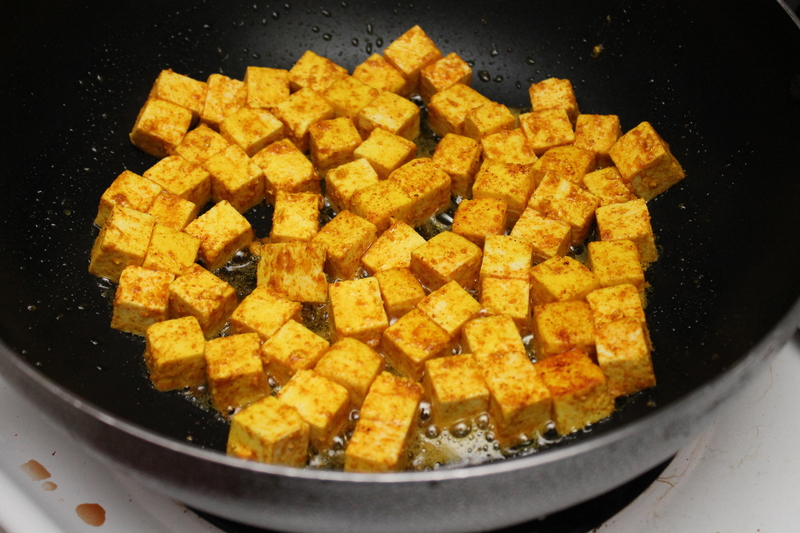 So, we start by cutting a large block of paneer into cubes and marinating them. Paneer is basically a creamy cheese that browns when you cook it, similar to the way halloumi browns, but much softer and less salty. If you don’t have an Asian market near you and can’t find easy access to paneer, here is a video tutorial for making your own! It seems fairly easy, but I haven’t tried it yet. While the paneer marinates, grate the ginger, mince or press your garlic, chop your onion (I used a slap chop to get it really nice and small), and mince your chile. I used a jalapeño because I had 6 in my fridge for some unknown reason, but you can probably use almost any hot chile you want. When your aromatics are prepped, set them aside and sear the paneer. You don’t want to dry the cheese out, just give it a nice browning on one or two sides. Lay them in a single layer in a large skillet and cook over medium heat until fragrant and lightly browned. This should take about 5 minutes, and you only need to stir or turn the cubes once or twice. Remove the paneer from the pan and set aside on a plate or in a bowl. Now let’s build the flavor base of the dish by cooking up all those onions and aromatics you just prepped. You need to cook these for about 15 minutes over medium-low heat, until they turn a nice, even, caramelly brown. 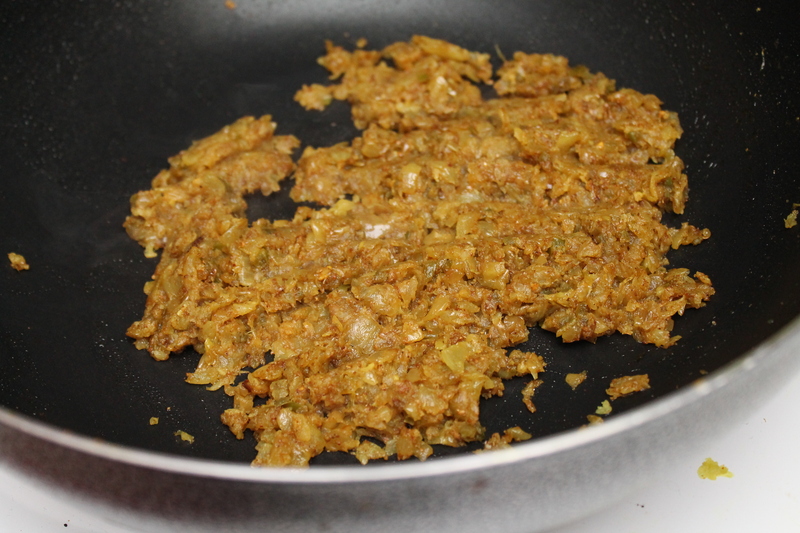 It may be hard to tell if when you reach this stage if you, like me, end up with a little of the turmeric from the paneer in the pan, as this will dye your onions yellow (as you can tell in the photo). But just cook, stirring regularly to prevent them burning or browning unevenly. The onions will eventually begin to seem a bit dry, or even pasty, as they cook into sort of a mush. Meanwhile, put the blocks of frozen spinach in the microwave and cook them for 5 minutes, or until softened. Don’t try to drain them…the extra water is going to come in handy for pureeing! Toss the spinach and any extra liquid into a food processor and run that baby on high for like 5 minutes. Spinach is tough, and you want it to be very, very, smoothly pureed in this dish. When the aromatics in the pan are golden brown, add the rest of the spices. Wow, that is fragrant! But do you notice how it seems a bit sharp and earthy, kind of raw? We don’t want to eat a ton of raw, hot spices. So keep cooking until the smell mellows out, another 5 minutes at least. Stir regularly to prevent burning. When the mixture starts to seem a bit dry, add ¼ cup water or so to moisten. We don’t want to eat burned spices, either! Now stir the spinach into the onion mixture. Add ½ cup water and a pinch of sea salt, and cook over medium-low heat, stirring regularly, about 5 minutes, until the mixture is soft and well seasoned. Turn the heat off and add the yogurt. (I used plain Greek yogurt, which isn’t terribly authentic, but I was reluctant to buy a whole tub of Indian whole milk yogurt just for one dish. I say use what you have, as long as it’s plain and unsweetened!) Stir in a little at a time, just to get it mixed in evenly and prevent the yogurt from curdling in the heat. If you are particularly sensitive to spice, you could add a little extra yogurt to cool the dish down somewhat. When the yogurt is incorporated, add in the paneer and turn the heat back on to low. Cook for another 5 minutes or so, until warmed through. If, at any point, the mixture seems dry or very thick, you can thin it with a small splash of water. 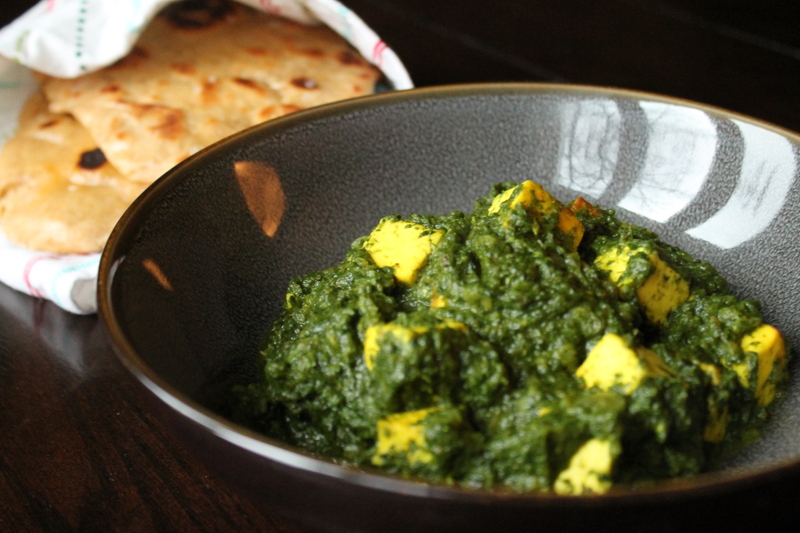 Serve the saag paneer hot with naan (or your carbs of choice!). 3 tbsp. canola oil, plus 1½ tbsp. In a large bowl, whisk together the turmeric, cayenne, salt, and 3 tbsp. oil. Drop in the cubes of paneer and gently toss to coat. Let the cubes marinate about 10 minutes. Meanwhile, finish the rest of the prep work. Place the spinach in a microwave-safe dish and thaw in the microwave, about 5 minutes on high. 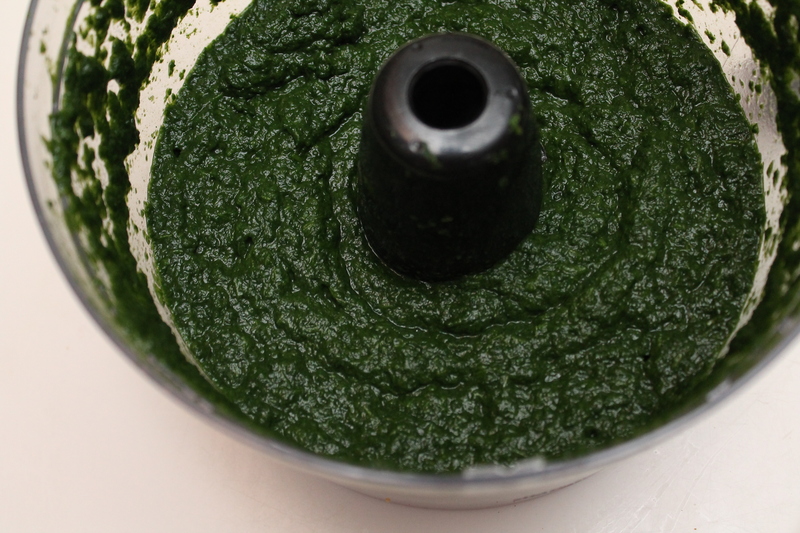 Puree the entire mixture (spinach and any extra liquid) on high speed in a food processor until very smooth. Heat a large, nonstick skillet over medium heat. 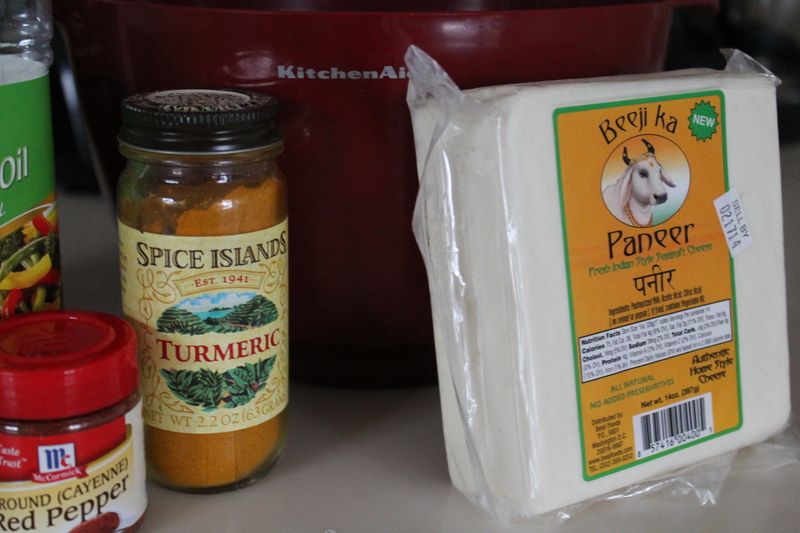 Add the paneer as the pan warms. After 3 minutes, give the pan a toss; each piece of paneer should be browned on one side. Fry another 2 minutes, then transfer the paneer from the pan onto a plate. Add the remaining 1½ tbsp. oil to the pan, together with the onions, ginger, garlic, and jalapeño. Sauté the mixture, stirring regularly, until evenly caramel-colored, about 15 minutes. Don’t skimp on this step, or the flavors will not balance and build correctly. If the onion mixture becomes dry or starts to brown too quickly, add 2 tbsp. water and continue cooking until evenly browned. Add the garam masala, coriander, and cumin. If the mixture is dry, sprinkle 1 tbsp. water into the pan to keep the spices from burning. 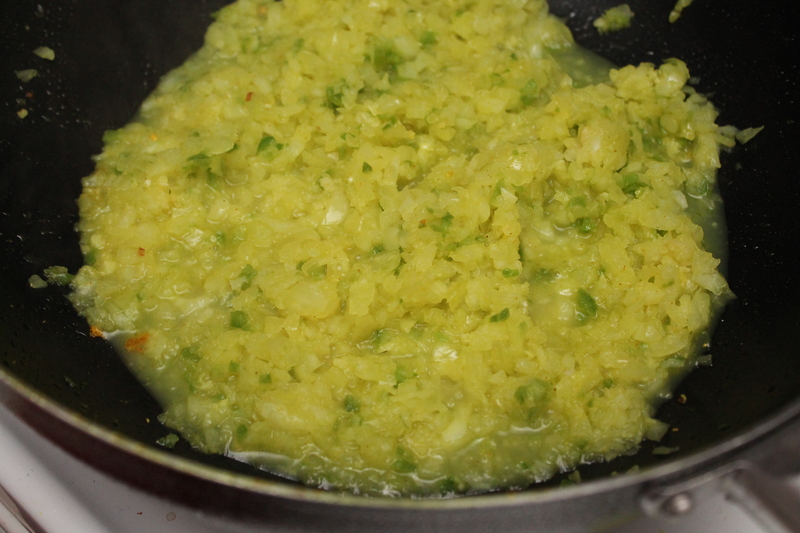 Cook, stirring often, until the raw scent of the spices cooks out, 3–5 minutes. 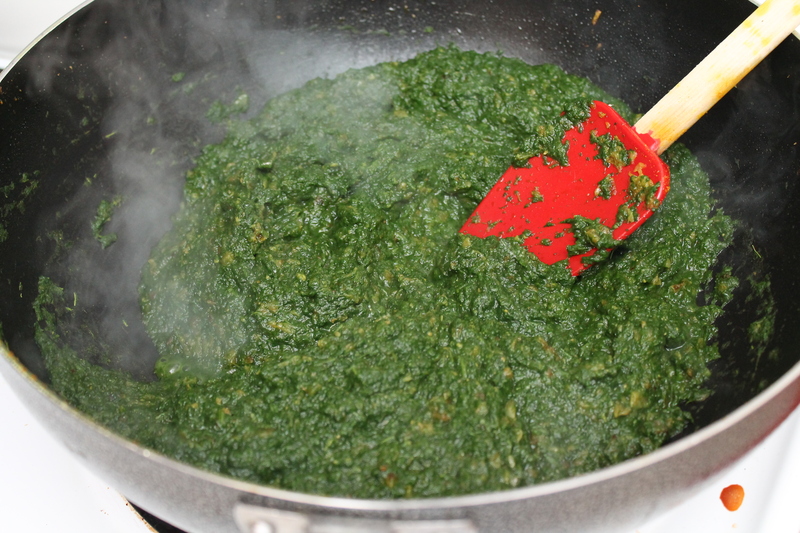 Add the pureed spinach and stir well to incorporate. Add a pinch of sea salt and ½ cup water. Cook, stirring regularly, about 5 minutes, until the spices permeate the spinach and the whole mixture is loose and fragrant. Remove the skillet from the heat. Add the yogurt a little at a time to keep it from curdling. 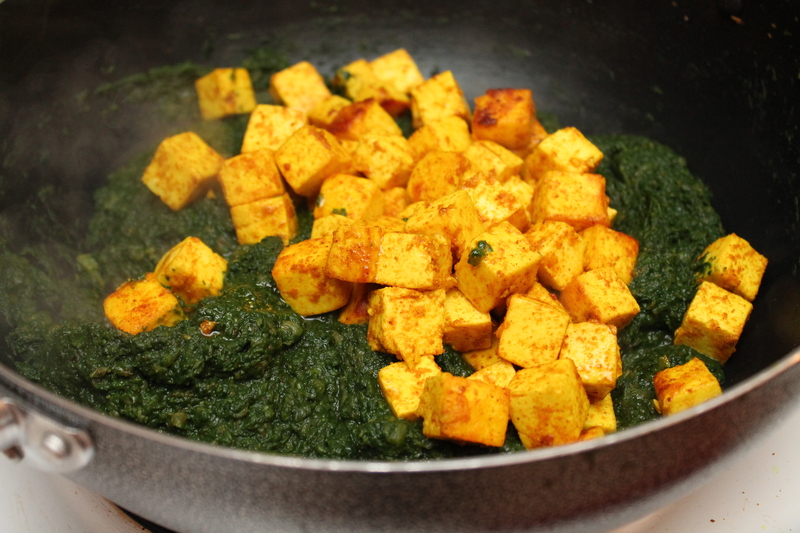 Once the yogurt is mixed into the spinach, add the paneer. Return the skillet to the heat and cook over low heat about 5 minutes, until everything is warmed through. Looks delicious. I had forgotten how much I like this dish. Thanks for the timely reminder. I love saag paneer but haven’t dared ordered it since going gf. This loves delicious. Thank you I will be making it now myself. I’m so glad! Saag paneer is one of my new cold-weather faves.